These allow three UTP or ISDN cables to be coupled. They will allow two computers to share one connection point, but with only one computer in operation at a time (i.e. 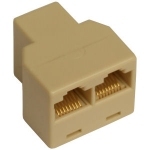 this is a simple double adapter, NOT an Ethernet hub or switch). All 8 lines are thus connected.